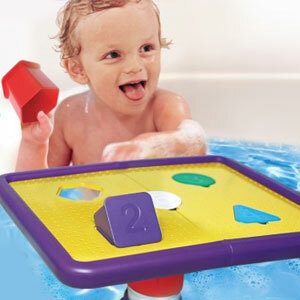 You are at:Home»2014 Holiday Gift Guide»Tubby Table keeping Bathtime fun! 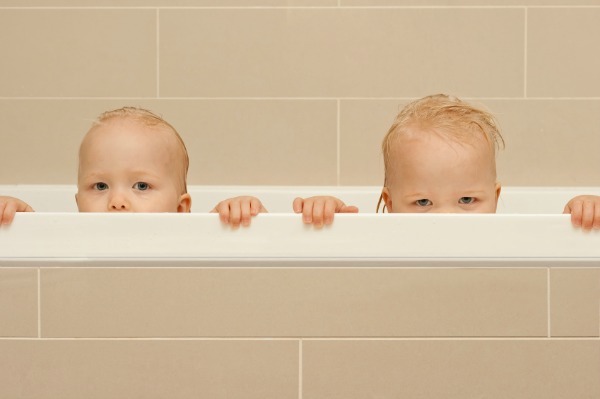 At a certain point in my kids’ lives (when they were young) it became a battle of the wits when bathtime came along. It was like trying to bath a cat that wanted no part of the water. What was up with that? hahaa! When my kids were babies they loved getting bathed. They loved splashing around, sticking toys to the walls, getting all soapy— even making their own “bubbles” haha! but then they hit an age when they acted as though water was the cause of an allergy. Pre-teen ages were the worst. They loved being little scrub balls. ICK! So far my grandson Baby E loves bathtime. He’s all over the place and trying to wash him is like wrestling an octopus. He get’s SO excited that he won’t sit still. And then try and take him out— oh boy, he never wants to leave the tub. The only problem with that is, there’s a huge mess of water and toys ALL over the bathroom once he’s done. Ugh! These two look like they’re either unhappy with bathtime or they’re up to no good. haha! That was until we received the Tubby Table. Now bathtime is more fun, but less messy and the bathroom floor is a whole lot drier. YAY! The Tubby Table was designed by moms of twins who wanted to provide a fun place for more kids (or even one) at bathtime with no more mess. This toy definitely does that and more! Each Tubby Table comes with 5 brightly colored cups to reinforce shapes, colors, numbers and counting. The table top itself has different cut out shapes so your child can learn shapes as they play and it makes a nice spot to store the cups when not in use. The table also has perforated holes throughout the top so when water is poured over, it quickly drains through. An included non-slip bath mat is a nice addition to this set. It provides a more stable place to sit when you’re child is in active play. Plus, the base of the Tubby Table comes with a sturdy suction cup so it stays put. Height adjustable, durable pedestal allows the table to grow with your child and/or as your family grows. Offers years of endless play value. Flat table surface allows for endless play with included cups or with your child’s favorite bath time toys. The Tubby Table measures 15″ x 9″ x 8″ and weighs 6 pounds. It’s the perfect size for nearly any bathtub and “grows” with your child as the height can be adjusted, when needed. Tubby Table also makes a nice spot for make believe play using your own play dishes and food. Serve up some bubbly brews or use the table top as a place for battle with action figures. It’s SO much fun to just sit back and watch as your child engages in fun without the mess of water all over your bathroom floor. Now you and your child can enjoy this time a whole lot more! Although made for ages 1-4, Tubby Table can still be used for older kids depending on their size. To be honest, I wish I had one when I was a child—- it’s THAT fun!